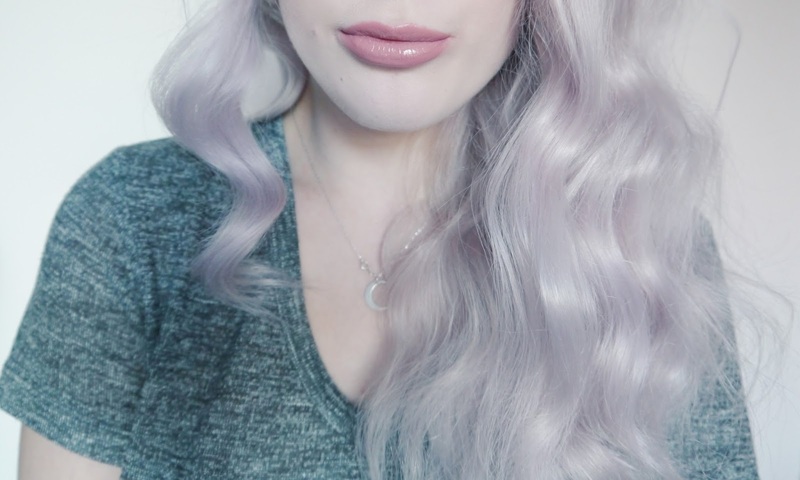 I always get a lot of questions on my hair, how I get it this colour (see post here) and how I care for it after it's been bleached. So, I thought I'd talk you all through my hair care routine, discuss about my favourite products and share some tips on how to care for dyed hair! Lee Stafford Bleach Blondes Shampoo - This is my holy grail shampoo, not only because it feels creamy and nice to apply, leaving my hair clean, but also because it's the secret behind my pastel coloured hair. I use this shampoo every time I wash my hair (which is every other day) and leave it on for around 5min. It means I don't have to spend ages faffing around with Crazy Colour any more! 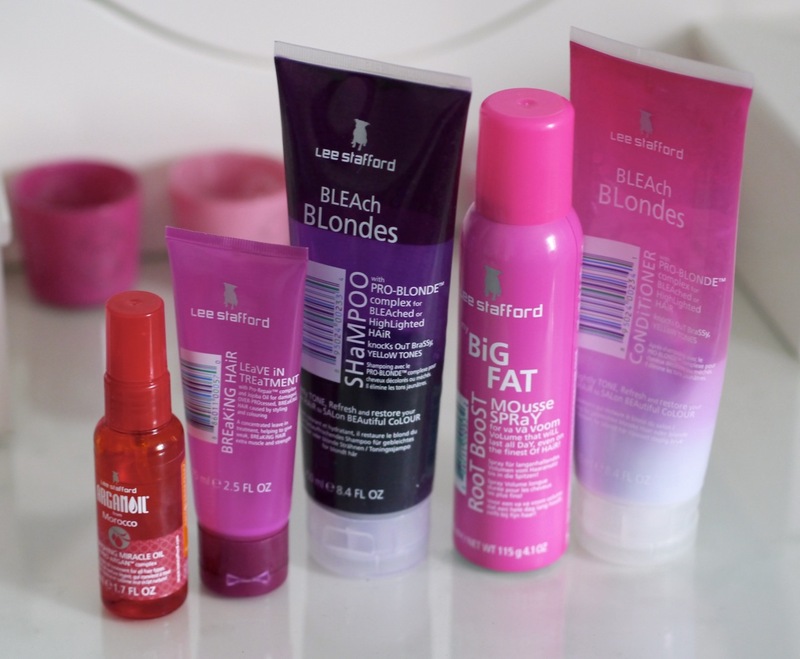 Lee Stafford Bleach Blondes Conditioner - I always buy my shampoo and conditioner on 3 for 2, so I buy two shampoos and one conditioner. This one is a great partner to the purple shampoo because it moisturises and nourishes my hair whilst helping to keep the grey/lilac tones. Lee Stafford Breaking Hair Leave-In Treatment* - My hair has been bleached, which means it needs some extra care. I apply a walnut sized blob of this leave-in treatment after every wash, running it through the ends of my towel-dried hair. I tend to then wrap my hair back up in the dry side of the towel for around 5min so the treatment can really soak in and get to work. I've almost finished this tube and I notice a huge difference when I use this product, it leaves my hair feeling so silky soft and nourished. Lee Stafford Moroccan Argan Miracle Oil - After I've taken the towel off my hair and the leave-in treatment has soaked in, I pump around 3-5 drops of this hair oil into my hands and run it through my hair, particularly focussing on the ends. My hair seriously drinks this stuff up! Sometimes I apply a generous amount to my hair a few hours before I'm about to wash it, for a more intense treatment. I try to avoid using heat on my hair, so I usually wash my hair in the evening, a few hours before I go to bed and let it dry overnight. I know this isn't ideal for everyone but I absolutely hate blow-drying my hair! If you can, also try to avoid brushing your hair when it's wet. This is when your hair is most vulnerable to damage and breaking, so just run your fingers through it and leave it a while before you go in with a hair brush! Massage your head for a couple of minutes when you apply your shampoo or conditioner. I try to do this as often as possible, as it stimulates the blood flow around your hair follicles which will encourage and stimulate faster hair growth! Do you have any tips for looking after your hair? *All items marked with an asterisk were gifted to me, all others were bought with my own money. All opinions, tips and advice in this post however, are my own. I've had bleached hair for almost four years now. Great tips! Hair is fabulous, i have bleached my hair for as long as i can remember now and it always ends in such bad condition. Great tips! Thanks!